Sunday  After your taxi pick up your luxury coach will travel down to Folkstone for our Eurotunnel crossing to Calais. We travel through France and Belgium before reaching our hotel in Luxembourg with time to settle before tonights evening meal. Comfort stops on-route. Monday  Today we enjoy a guided visit of the Chateau de Vianden, located in Vianden near our hotel, in the north of Luxembourg, is one of the largest fortified castles west of the Rhine. With origins dating from the 10th century, the castle was built in the Romanesque style from the 11th to 14th centuries. Enjoy some free time to explore the narrow and paved lanes, the gothic churches, the ramparts and fortified towers of the small medieval town, dominated by the magnificent, restored castle. 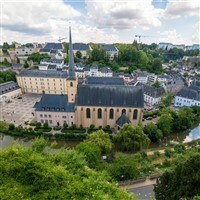 Thursday  After breakfast we leave Luxembourg towards Calais for our return Eurotunnel crossing to Folkestone then onward back to our waiting taxis in Wiltshire after a fascinating tour of beautiful Luxembourg. Overlooking the river and historic castle this environmentally friendly hotel offers wooden beams and rustic features. All bedrooms are en-suite with satellite TV and WiFi.